Early in the summer of 2018, Seeds of Hope Publishers partnered with the Baylor School of Education's Freedom School to create a learning track for reporting about hunger. The Freedom School curriculum comes from the Children's Defense Fund and is inspired by the Freedom Schools of the 1960s Civil Rights Movement. 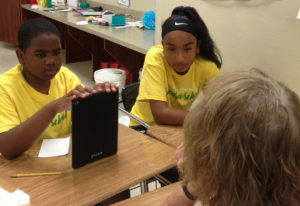 Baylor's School of Education conducted its second Freedom School in Waco, TX, this summer, working to build strong, literate, empowered children. This learning track was inspired by a 2003 day camp in which Seeds staff and Megan Sims, then the children's minister for Seventh & James Baptist Church, taught a group of children how to report on local agencies that helped to get food to people in need. The end product of that camp was the newsletter Hungry for Hope. When Baylor Freedom School director Lakia Scott heard about the Hungry for Hope camp, she immediately wanted to add a similar learning experience to the Freedom School curriculum for 2018. 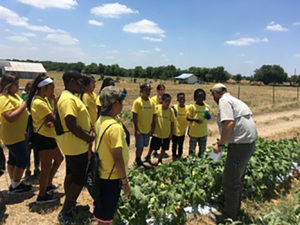 Scholars visit the World Hunger Relief, Inc. Training Farm near Elm Mott, TX. 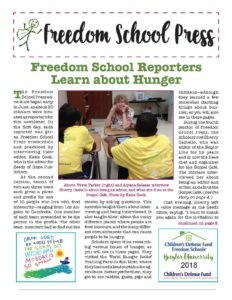 Our Freedom School Press adventure began on Tuesday, June 12, as about 30 scholars were initiated as reporters for this newsletter. On the first day, each reporter was given Freedom School Press credentials and practiced by interviewing their editor, Katie Cook, the Seeds editor. At the second session, teams of two and three were each given a photo and profile for one of 10 people who live with food insecurity—ranging from Los Angeles to Cambodia. One member of each team took on the identity of each profile. The other team members had to find out the stories by asking questions. This exercise taught them about interviewing and being interviewed. It also taught them about the many different places where people are food-insecure, and the many different circumstances that can cause them to be hungry. Scholars interview Sherry Castello about the Gospel Cafe, where she organizes meals for hungry people. Click here: Freedom School Press to download the full newsletter.